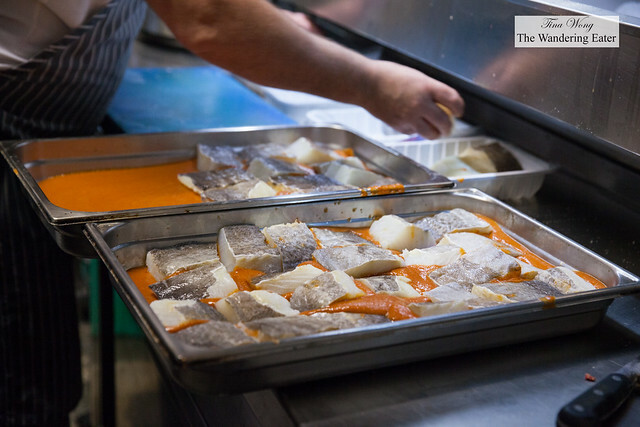 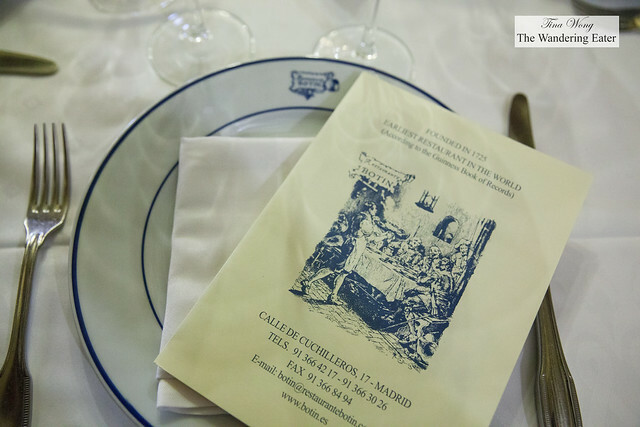 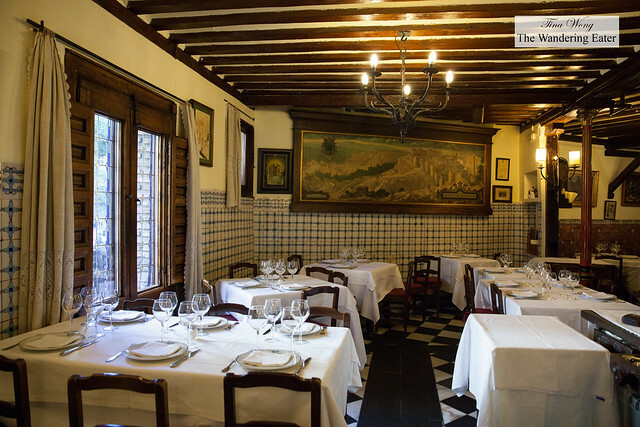 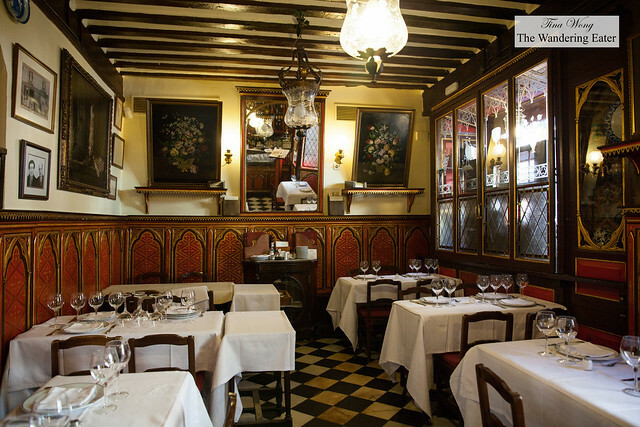 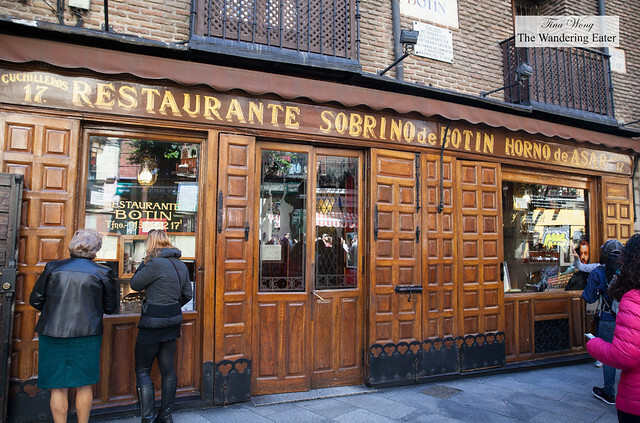 Sobrino de Botín is one of the oldest restaurants in Madrid operating since 1725. 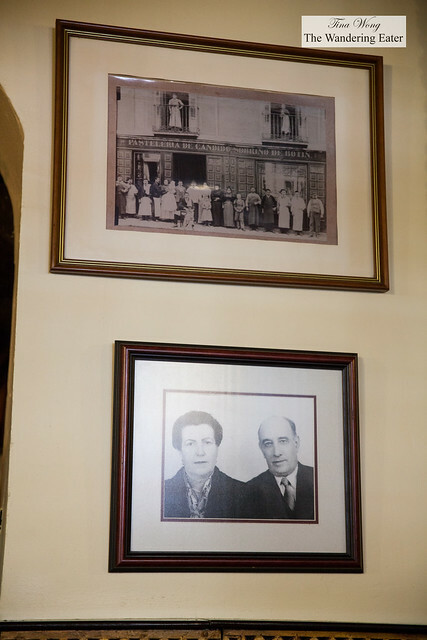 First opened as an inn, the landmark eatery was founded by French cook Jean Botín and his wife. It is the world’s oldest restaurant according to the Guinness Book of Records. 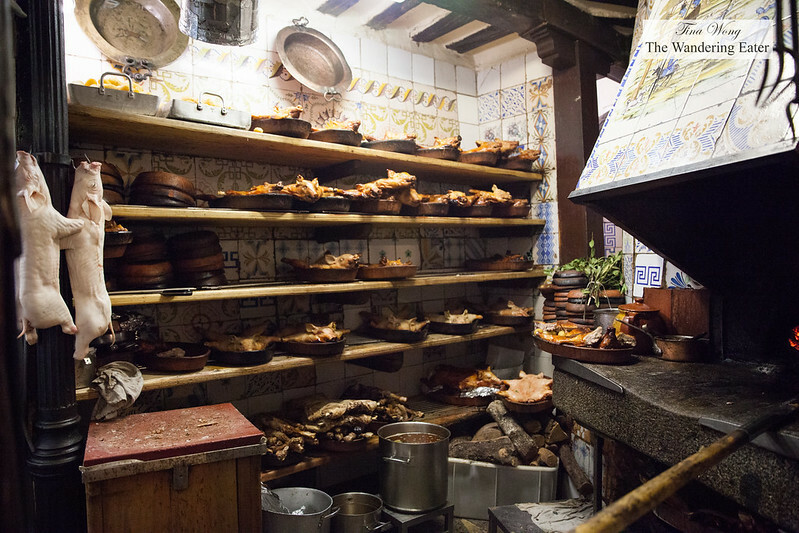 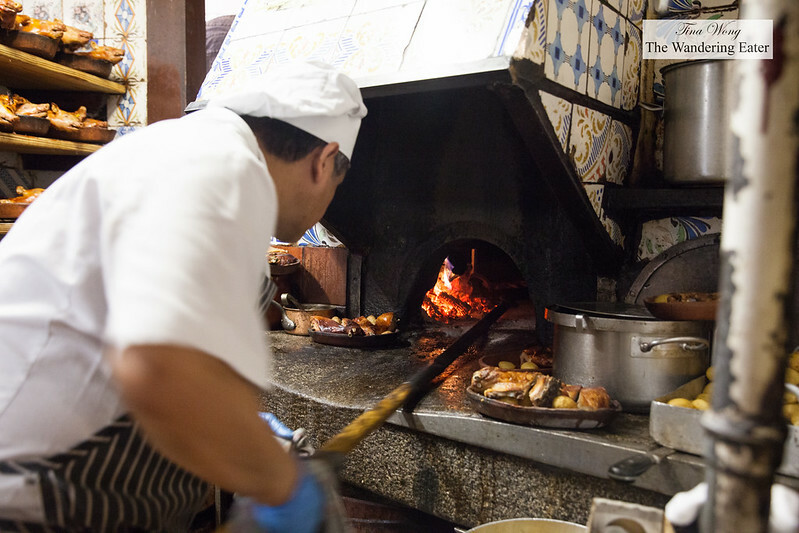 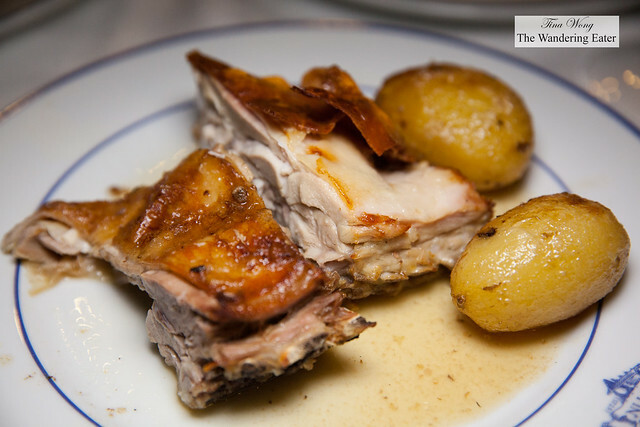 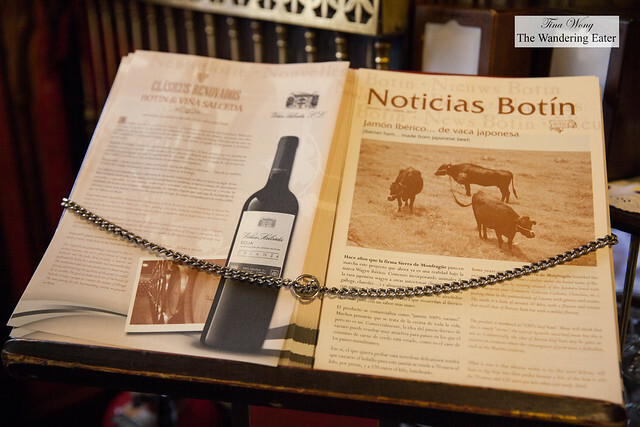 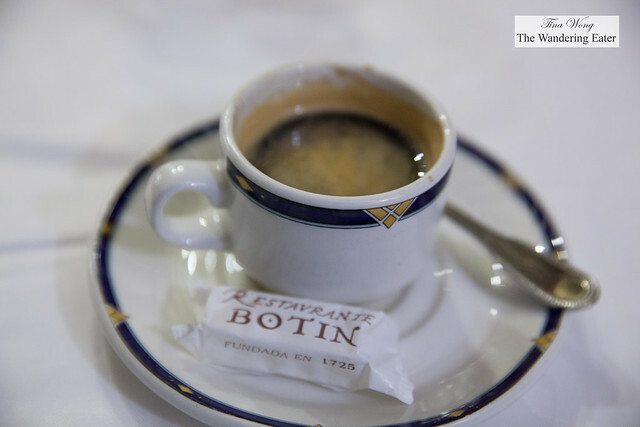 Today, Botín is famed for its rustic Castilian cuisine, including succulent roast meats fired in an wood-fired oven made of cast iron that’s close to 300 years old. 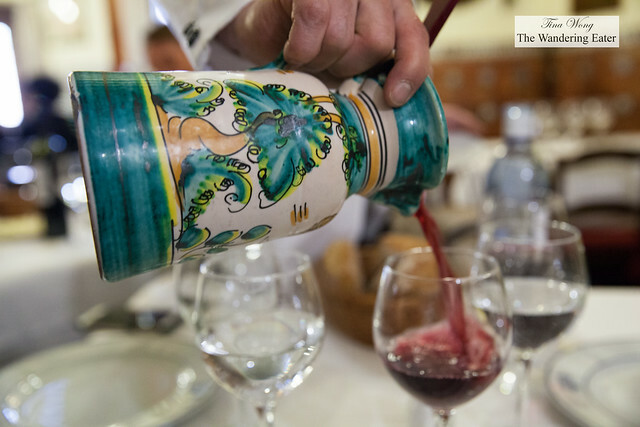 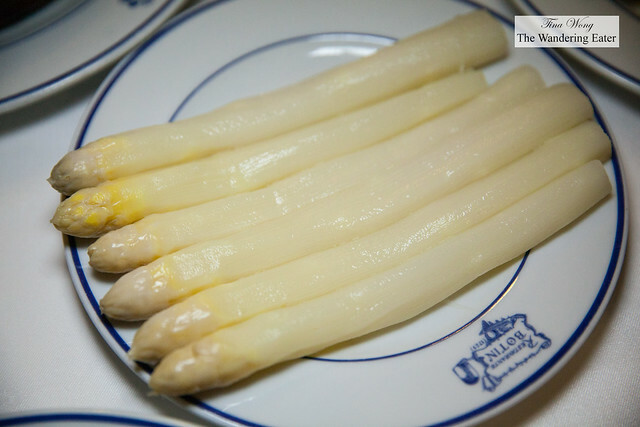 We started off with a carafe of fruity but not too sweet sangria, blanched white asparagus and callos a la Madrileña. The asparagus was served cold with a side of mayonnaise and it was a solid vegetable dish. The stewed callos a la Madrileña was tasty but a little bit sweeter and not as melting tender than what I prefer. Chipirones en su tinta (baby squid in its ink) served with white rice was a very good dish. 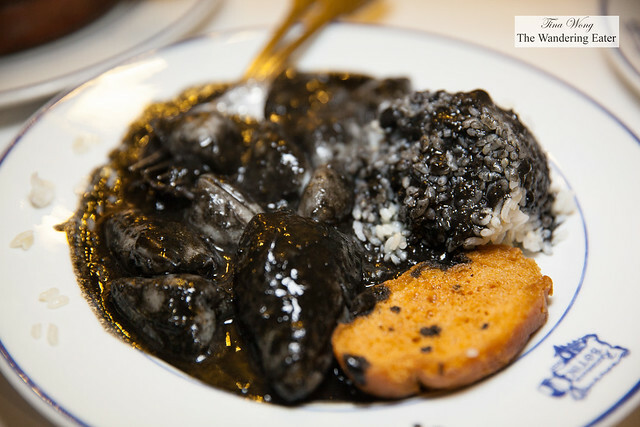 The briny squid ink flavors the dish beautifully and it’s seasoned just right. 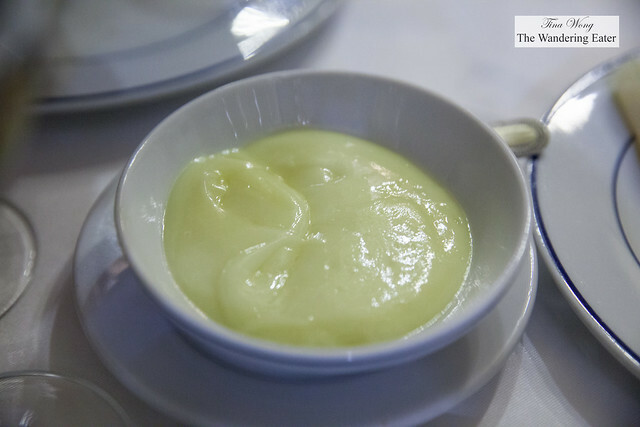 The rice was a wise choice of carbohydrate to absorb the flavors of this sauce. 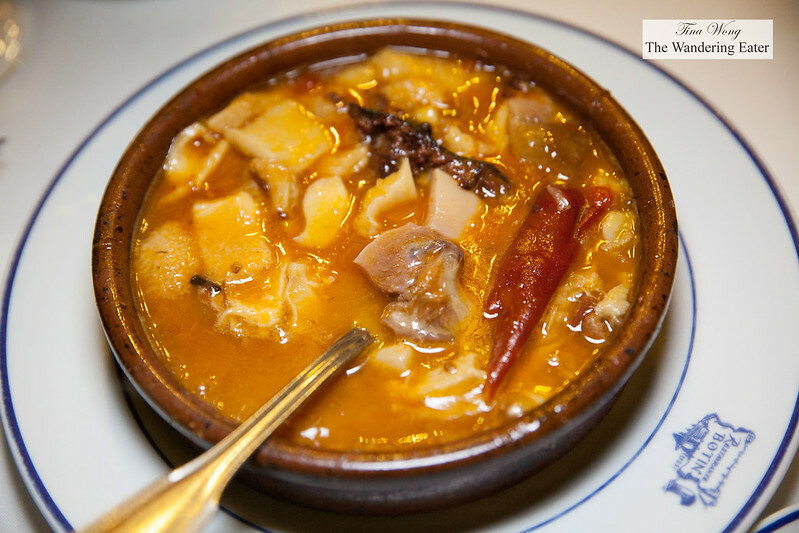 The squid was tender with a little chew (as it should). 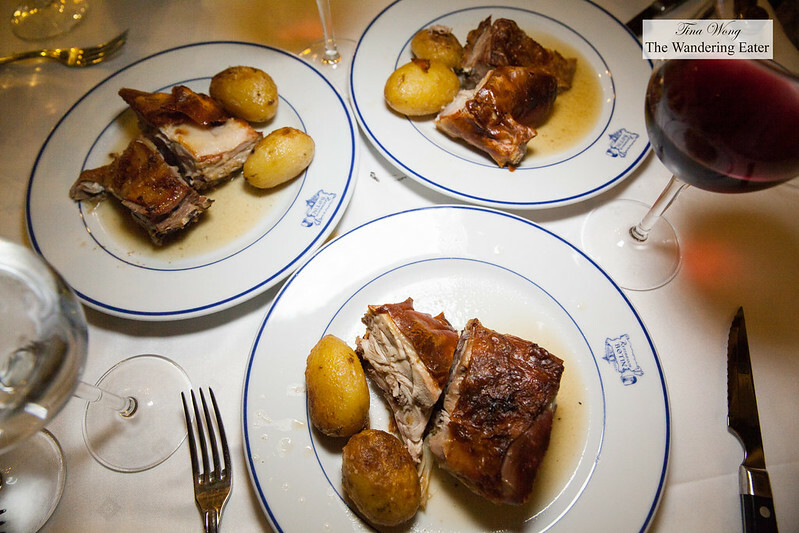 The famous dishes of the restaurant are the cochinillo asado (roast suckling pig) and the cordero asado (roast lamb). 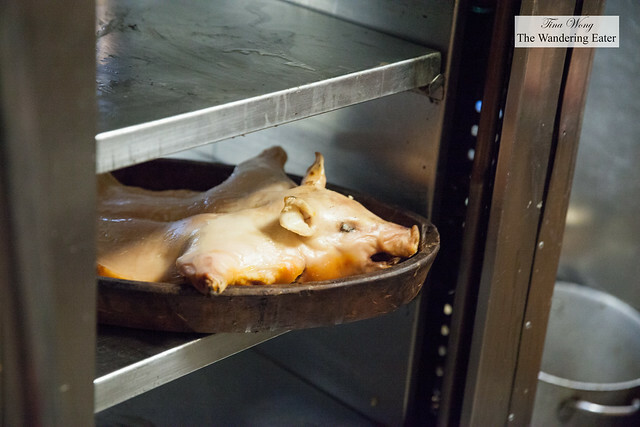 The restaurant receives suckling pigs from Segovia and lambs from Sepúlveda three to four times per week and roasted in that old oven. 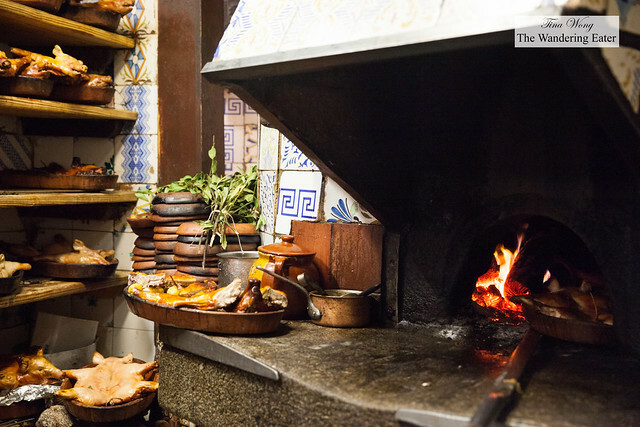 We ordered both meats and despite the fact the cast iron platters of these roasted animals were literally run up the stairs, it landed to the waiter’s station and it was plated for us with a side of roast potatoes. Both the pig and lamb had some crispy skin on the outside and tender meat on the inside. Satiated with the meal, we opted for espresso instead of having dessert.